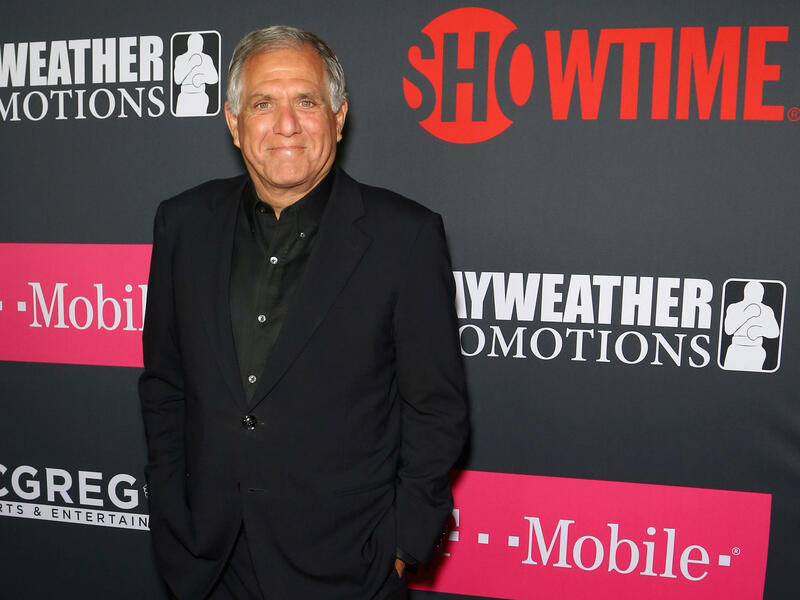 CBS CEO and Chairman Leslie Moonves arrives arrives at a promotional boxing aprty in August 2017. The 68-year-old has been accused by six women of sexual assault and harassment. The decision was made after an hours-long board meeting on Monday, just three days after The New Yorker published a detailed report that included the accounts of six women who claim Moonves thwarted their acting careers after rejecting his verbal or physical advances. Some of the alleged assaults date back to the 1980s through the 2000s. In a statement issued by CBS the company confirmed it is "in the process of selecting outside counsel to conduct an independent investigation." "No other action was taken on this matter at today's board meeting," it read. In an interview with NPR's All Things considered, Emmy-award winning writer and television producer Dinah Kirgo described meeting Moonves to discuss a potential television deal before he joined CBS. Kirgo — one of the six women whose experience with Moonves was included in the magazine story — said the meeting "went really well" but was surprised when Moonves, who was married to Nancy Wiesenfeld at the time, asked to meet her privately over dinner. "I'm not actually sure what I said in response, but he said, 'Look, you're really expensive and I need to know you're worth it,' " she recalled. Kirgo said she made an allusion to Moonves' wife, and her feelings about a one-on-one dinner between the two. "And the conversation ended, and he went from being very friendly to being really cold." That was the last Kirgo heard from Moonves, she told NPR. Moonves has responded to questions about the allegation from The New Yorker's Ronan Farrow, writing: "I recognize that there were times decades ago when I may have made some women uncomfortable by making advances. Those were mistakes, and I regret them immensely. But I always understood and respected—and abided by the principle—that 'no' means 'no,' and I have never misused my position to harm or hinder anyone's career." Moonves' current wife, television personality Julie Chen, addressed the sexual assault accusations against her husband on The Talk, a daytime talk show on which she is a host. Looking directly into a camera Chen said, "Some of you may be aware of what's been going on in my life the past few days. I issued the one and only statement I will ever make on this topic on Twitter. And I will stand by this statement today, tomorrow, forever." Chen's Twitter statement was posted on Friday, shortly after Farrow's story was published. In it, she wrote: "Leslie is a good man and a loving father, devoted husband and inspiring corporate leader. He has always been a kind, decent and moral human being. I fully support my husband and stand behind him and his statement." CBS shares plunged on news of the company's investigation. Moonves has headed CBS Corporation since 2016. On Monday the CBS board decided to postpone the company's 2018 annual stockholder meeting that was scheduled to be held on August 10. A new date has not been announced.